If you’re not looking to live downtown, Chicago’s north side is a fabulous place to call home. Offering a true neighborhood feel that’s hard to match anywhere else in the city, there’s lots to love about any north side neighborhood, but especially North Center. While nearby neighborhoods like Lincoln Park and Lakeview seem to get lots of attention, North Center is a unique location for potential home buyers to consider for a wide range of reasons. First, given North Center’s location that sits just a bit further off the lakefront, the first thing you’ll notice is its lack of traffic and congestion in comparison to other lakefront neighborhoods close by. Furthermore, North Center also doesn’t have quite the number of attractions and destinations as Lakeview or Lincoln Park, also helping keep the constant hustle-and-bustle to a minimum. But with that said, Chicago’s North Center neighborhood is still full of charming restaurants and cafes, as well as a fairly high concentration of bars, taverns, and other small businesses, helping maintain a high level of appeal and desirability for anyone considering a move here. So where exactly is North Center? Well, as mentioned above, this lesser known neighborhood is situated just west of Lakeview and bounded by Montrose Avenue to the north, Diversey Parkway to the south, the Chicago River to the west, and Ravenswood Avenue to the east. As one of Chicago’s 77 defined community areas, a few popular sub-neighborhoods are also part of the North Center community, including Roscoe Village and St. Ben’s. But despite its rather large area, the heart of North Center is centered on the six-way intersection at Irving Park Road, Lincoln Avenue, and Damen Avenue. It’s here you’ll find an assortment of restaurants, cafes, bars, book stores, small retail shops, and even a small movie theatre just a few blocks north. Already have a good idea of what you're looking for in Chicago’s North Center neighborhood? Narrow down your options and only browse exactly what it is you want! And if you don't see what you're looking for below, let us know and we'll set you up on a custom search that sends MLS listings that meet your search criteria straight to your inbox. 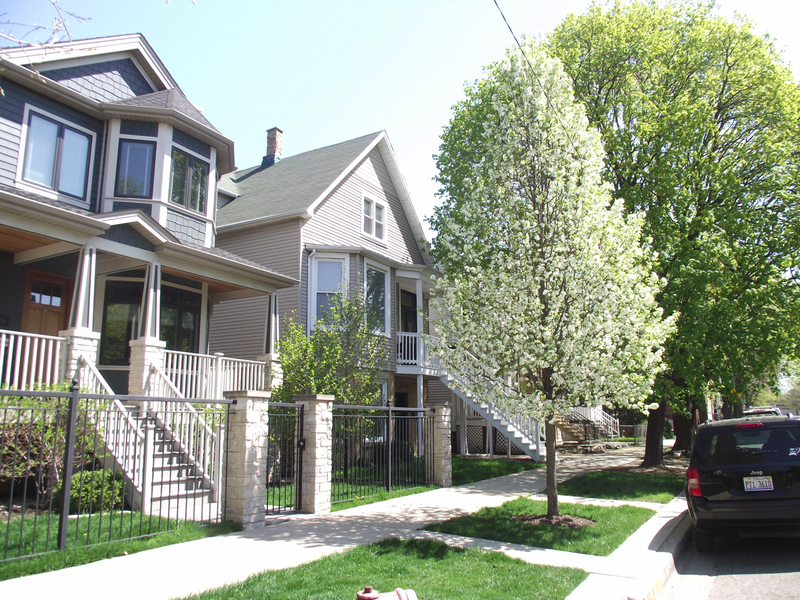 On the neighborhood’s interior, quiet residential tree-lined streets fill the area landscape, with North Center real estate consisting of higher-end single-family homes, quaint vintage condo buildings, and some of the most charming (and affordable) two-flat gray stones you’ll find anywhere in the city. And regardless of what you may be searching, perhaps the best part about North Center real estate is the value. Compared to the various north side neighborhoods mentioned above, home prices here are considerably lower, while location-wise, you’re really not all that far away. So, to learn more about North Center real estate for sale in Chicago, give us a call today at (312) 280-9600, or simply click on any of the active MLS listings featured below for additional info! Need to Sell Your North Center Home or Condo? If you're looking to sell your North Center home or condo in today's ultra-competitive market, contact Gold Coast Realty to learn more about how we can get your property sold fast, and for the price you need!